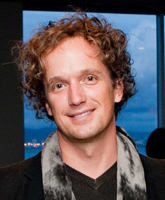 At its May meeting, the Board of Trustees of the San Francisco Museum of Modern Art (SFMOMA) elected Yves Béhar as the museum’s third Artist Trustee. Béhar joins Irwin Federman, who was also elected as a trustee at the meeting. Board Chair Charles R. Schwab also announced the appointment of Robert J. Fisher as Board President and confirmed the officers of the Board for 2010 to 2011. “These appointments come at a transformative time for SFMOMA. In response to the tremendous growth of the museum’s programming, collections, and audiences in recent years, SFMOMA is planning for an expansion that will triple the museum’s gallery and public spaces; support enhanced exhibitions, educational programs, and services for the public; and showcase the exceptional Doris and Donald Fisher Collection of modern and contemporary art,” says Schwab. Robert Fisher joined SFMOMA’s Board of Trustees in 2003. He currently serves as trustee of the Fisher Art Foundation. From 1980 to 1999, Fisher served in leadership and executive roles at Gap Inc., the company his parents, Doris and Donald Fisher, founded in 1969. He served as interim chief executive officer of Gap Inc. in 2007. He has been on the Gap board of directors since 1990 and was chairman from 2004 to 2007. Underscoring a strong personal commitment to philanthropy and the environment, Fisher is a trustee on various nonprofit boards, including the Conservation International Executive Committee and the Strategic Growth Council, and is currently vice chair on the board of the Natural Resources Defense Council. Fisher received a BA from Princeton University and an MBA from Stanford University Graduate School of Business. Yves Béhar, a Swiss-born, multi-award-winning industrial designer, joins the Board at the recommendation of Director Neal Benezra as SFMOMA’s third Artist Trustee, a position previously held by acclaimed photographer Larry Sultan, who passed away earlier this year. SFMOMA maintains one permanent seat on the Board for an Artist Trustee who is elected for a fixed term of three years to represent the artist community and give counsel to the Board. The Artist Trustee is selected to represent the areas of SFMOMA’s collection—painting and sculpture, photography, architecture and design, and media arts. SFMOMA’s first Artist Trustee was Robert Bechtle, who served on the Board from 2006 to 2009. Béhar’s design work spans an array of fields as diverse as personal care, fashion, sports, music, and technology. He is the principal and founder of fuseproject, a San Francisco–based design and branding firm with clients such as Birkenstock, MINI and BMW AG, Target, Disney, Method, Nike, Microsoft, and Swarovski. Béhar is also a distinguished professor in the industrial design department at the California College of the Arts. His relationship with SFMOMA began in 2000, when his work first entered the museum’s collection. In 2004, his work with fuseproject was the focus of the museum’s second installment in the Design Series, which is devoted to showcasing emerging talents in the fields of architecture, graphic design, and industrial design. Béhar has also exhibited at the Musée de design et d’arts appliqués contemporains in Lausanne, Switzerland; the Cooper Hewitt Museum in New York; and the Chicago Athenaeum Museum. Irwin Federman is a general partner at U.S. Venture Partners (USVP). He joined USVP in 1990 as a veteran of the semiconductor industry and venture capital community. He is a former chairman of the Semiconductor Industry Association and served as a board member of the National Venture Capital Association. Before joining USVP Federman was CEO of Monolithic Memories and led the firm’s investments in successful startups such as Cypress Semiconductor, Xilinx, and Altera. Federman received a BS in economics from Brooklyn College and was awarded an honorary doctorate of engineering science from Santa Clara University. He was installed in Junior Achievement’s Silicon Valley Hall of Fame and received the Anti-Defamation League’s Torch of Liberty and the Exemplary Community Leadership Award from the Silicon Valley Conference for Community and Justice. He serves as a trustee of the San Francisco Ballet and of Brooklyn College. Federman and his wife Conception (“Ceppie”) have been members of SFMOMA’s Director’s Circle since 2000, and the couple enjoys traveling with the museum. The role of SFMOMA’s Board of Trustees is to support the museum’s director, embrace the mission of the museum, and contribute to its stability and vitality, while sharing a long-term vision to ensure its enduring excellence. Trustees are advocates for the museum within the larger community and seek out opportunities to expand audiences. The two new Trustees join a group of leaders in business, the arts, and philanthropy in the Bay Area and nationally. A complete list of the SFMOMA Board is available at: https://www.sfmoma.org/pages/about_bot. SFMOMA is pleased to announce that Ruth Berson, deputy director of exhibitions and collections, has been elected to the board of the International Council on Museums (ICOM). Berson’s appointment is particularly celebrated since the museum’s founding director Grace McCann Morley was the first head of the Museum Division of the United Nations Educational, Social and Cultural Organization (UNESCO); participated in the establishment of ICOM; and served as founding editor for ICOM’s journal Museum, the first publication to outline basic museum principles and practices for both developed and developing nations. ICOM is the international organization of museums and museum professionals, which is committed to the conservation, continuation, and communication to society of the world’s natural and cultural heritage, present and future, tangible and intangible. Created in 1946 and based in Paris, ICOM is a nongovernmental organization maintaining formal relations with UNESCO and having a consultative status with the Economic and Social Council of the United Nations. Selected for her leadership in the American museum field in relationship to international matters, Berson was elected from the ranks of science, history, and art museums throughout the United States. Her three-year term began at the American Association of Museums conference in May. Berson is the sole member of her incoming class to have been asked to serve on the Nominating Committee. SFMOMA is also pleased to announce that Dominic Willsdon, SFMOMA’s George and Leanne Roberts Curator of Education and Public Programs, has been awarded the inaugural Kress Summer Fellowship in Museum Education at the Sterling and Francine Clark Art Institute in Williamstown, Massachusetts. Willsdon will research aspects of past and present models for the education of artists and develop proposals for future models that involve museums. The Clark is one of a small number of institutions in the United States that combines a public art museum with a complex of research and academic programs, including a major art history library. The Clark functions as an international center in both the academic and museum fields for research and discussion on the nature of art and its history. The fellowship is intended for an ambitious and imaginative educator whose project explores critically the relationship of scholarship to the public understanding of art or who seeks to explore new avenues and innovations in museum education, understood in its broadest sense. In addition, SFMOMA Assistant Curator of Painting and Sculpture Apsara DiQuinzio was awarded a Curatorial Research Fellowship from the Andy Warhol Foundation for the Visual Arts. The program was launched in 2008 to encourage original, in-depth research leading to new scholarship in the field of contemporary art. Grants of up to $50,000 are awarded to institutionally affiliated curators twice a year in support of travel, archival research, convening of colleagues, interviews and other activities. DiQuinzio says about her project Correspondences (tentative title), “Now more than ever, cultural artistic centers operate as interconnected constellations that possess the ability to broaden one another’s initiatives through the development of exchange with divergent communities.” In organizing this exhibition, which will open in fall 2012, she seeks to initiate correspondence with artists and art professionals living in specific distant geographic regions that have recently become important artistic centers and home to thriving local art communities. In addition to San Francisco, the exhibition will convene artists from cities in Colombia, Lebanon, Morocco, Romania, and Thailand—places that, like San Francisco, are not considered major artistic centers, but act as critical cross-cultural platforms for those living and working there. Cultivating an awareness of our collective, international contingency is a primary motivation underlying the exhibition. The exhibition title echoes the poem by Charles Baudelaire titled “Correspondences.” Widely considered one of his most important poems, it describes a synesthetic form of communication that transcends language and is based on the senses. In many ways, the poem advocates for the importance of recognizing that all things surrounding human experience are interconnected, and human flourishing depends on one’s ability to identify and communicate with one’s heterogeneous environment.